Since 2008, the Cleveland Foundation has brought more than 90 accomplished or rapidly rising artists from around the world to Cleveland as part of an international arts residency program. Each year, artists from Creative Fusion cohorts are hosted by local cultural institutions during a three-month residency. Creative Fusion artists collaborate with local Cleveland artists on a commissioned project during their stay, and engage directly with the community, making strong connections and exchanges. Beginning in 2016, the program strengthened collaboration between local Cleveland artists and the visiting artists by focusing each Creative Fusion cohort along a theme. Check out the news release on Creative Fusion: Waterways to Waterways Edition. Learn more about Creative Fusion: Data Edition here. Presented in partnership with the Cleveland Museum of Art’s longstanding, year-round performing arts series, this Creative Fusion residency brings six diverse composers from around the world to the Cleveland Museum of Art, where they will draw inspiration for original compositions to be performed in Cleveland over the next two years. During their time in Cleveland, the composers will immerse themselves in the city and the museum’s collection. Learn more about these composers and the Creative Fusion: Composer Series residency here. The spring 2017 residency, Creative Fusion: Cuba Edition, was likely the first-of-its-kind exchange connecting cultural institutions of a major Midwestern city with a selection of celebrated Cuban artists for an extended project-based residency. The multidisciplinary cohort included internationally renowned artists showcasing the best in architecture, design, printmaking, photography/mixed media, the written word, ballet and modern dance. Learn more about Creative Fusion: Cuba Edition here. Read about the 2016 Creative Fusion Hingetown project here, and see the murals here. Learn more about Creative Fusion by listening here. 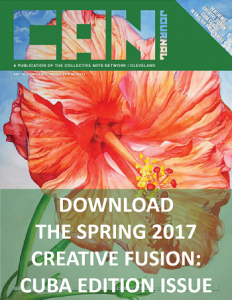 Read about the partnership between Creative Fusion and CAN Journal here.